I LOVED IT! Noah Zarc Mammoth Trouble is an excellent middle grade adventure that keeps the reader on the edge of his/her seat. The characters are endearing and the story has such depth and true emotion throughout. The story is full of danger, boyish determination, and fantastic adventure. The reader can join Noah and his family on an exciting journey through time and space to save earth and lives of the ones they love. Some difficult choices must be made, but will Noah make the right choice in time to save his loved ones? Find out for yourself, read Noah Zarc: Mammoth Trouble by D. Robert Pease today. I really enjoyed reading this book. 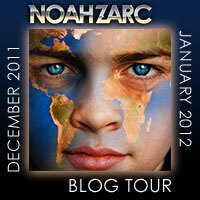 I’m anxious to read the next book in the Noah Zarc adventures! What a lovely review. Thanks so much! I think I would spend on kids books for my little one. I've visited the author's website and learned that D. Robert Pease has been interested in creating worlds since childhood. I would use it to help add to the collection of various books for my grandson who is being tested and worked with for Aspergers Syndrome. He needs help in various fields and this surely would be a great help. Thanks for this giveaway! I visited the website, the book "Mamouth Trouble" sounds awesome and I discovered these books are sold for kindle which is what my sister just got so I think she will be interested in hearing about these books. Thanks so much! If I won I would buy an ereader, just for me. I shared on facebook under Marjorie Roy. What an excellent giveaway! Thanks for the chance! I would love to win and would use the money for my co-author and me to go to a writing conference. I have heard such wonderful things about this book and the author. I remember that Kid n' Books named it as one of the top 5 best books of 2011. I cannot wait to read it. The cover is also interesting. I liked the post on fb as Stephanie Peterson. I checked out his author site and am now following him on twitter (I alread follow him on fb). I loved reading about his favorite books and he wrote such a nice review of nate Rocks the World. I love the play on words with the characters' name - Noah Zarc! Would love to win the giveaway for new books for our homeschool. Great review! My 11 year old loves to read and this sounds like a great book for him. Something different that would really hold his attention. I'd use the giftcard to get birthday presents for my son. I visited the author's site! I have an 8 year old son and it's darn near impossible to find books that he is interested in. D Robert Pease's books look perfect! I'd buy books that have been forever on my Amazon WL. +1 and shared on Google+ as Cayce E.
Btw, loved his "funny" faces. I learned that Noah's mom has been kidnapped and taken to Mars! With a $50 Amazon gift card, I'd purchase something from my Amazon wish list! I would buy camera stuff! I gave this post a +1. I clicked "like" on this post! I visited the author's website! "One of the great things I've discovered about being a published author, is all the cool people I get to meet. Someone who definitely falls into that category is Karen Pokras Toz." I would use the amazon credit to buy my daughter a few birthday gifts for her upcoming birthday. I would love to buy a lamp for my daughter's bedroom so she can READ before going to sleep! I would buy a few books that are on my "wanted" list. I would spend the Amazon $50 on books and gifts for Valentine's Day. I would buy my son birthday presents! I would use the gift card to buy my 5 year old the early readers books. Only 8 more months till Kindergarten...gotta get crackin'. hahaha. Visited the author's website and thought Crimson Swarm looked good. My oldest son is only 5 right now but I know if a few years he's going to love this stuff!! This sound likes an entertaining book. I would buy books with the Amazon card. I visited the author's website. I'd use it to let my daughter pick out some books for her to read. I liked this post-gloria m.
I publicly +1'd this as gloria mckellar. I visited the author's site and told my nephew about D Robert Pease's books which I know he'd like! I learned that Noah is a paraplegic since birth. I'd fill up my Kindle with not-free books with $50 to amazon. I would get house stuff or books and magazines! I "...publicly +1'd this as June Lisle". I went to the author's website. I like how you can read some of the beginning of the book before you buy. This book would be fun to read for kids. I would get books with the $50 Amazon card. This would be a good book. If I won, I would probably look into getting an e-reader for my bookworm daughter. I would put that $50 straight to work by gathering goodies for my wedding in May! I would put the $50 toward a new camcorder. Noah lives for piloting spaceships through time, dodging killer robots and saving Earth's animals from extinction....life can't get any better than that! If I won a $50 Amazon Gift Card, I would spend it on a nice new coffee maker. I also visited the author's website and checked out his blog. I would probably buy books with the giftcard. We are moving so I would love to be able to buy stuff we need for the kitchen- some pans and utensils! I learned that the time traveler is twelve. I would probably buy towels with the gift card. Great review. I hope you win the $50 too!! I would buy myself a new pair of slippers and buy my husband a few new books for Valentine's day. I would buy birthday gifts! If I won, I'd buy books! Visited the author's web site and found out that he has a blog. i would use it to get my hubby a anniversary present.. I visited the authors website and I'm looking forward to the sequel! I visited his website. I really think my nephew would like this book! I have an 11 year old who is a voracious reader and who would LOVE to get a new box of books to plow through. Thanks!